The time is nearing for government entities to set their fiscal year 2018-2019 budgets and the Nye County Water District Governing Board is already prepared with a tentative budget approved at its March 26 meeting. Horace Langford Jr./Pahrump Valley Times Nye County Water District General Manager Oz Wichman as shown in a 2016 file photo. The water district is anticipating to close out this fiscal year, 2017-2018, with $229,000 remaining in its coffers. The final budget is required to be approved by May 31. The water district is anticipating to close out this fiscal year, 2017-2018, with $229,000 remaining in its coffers. Combined with an expected $275,000 in revenue via the $5 per parcel fee assessed on Nye County properties and projected interest revenue of $3,500, the water district is budgeted to see $570,500 in available funds for fiscal year 2018-2019. Of this amount, the tentative budget approved on Monday laid out expenditures of $416,400, which included much of the same line items that the district has seen in the past. However, Nye County Water District General Manager Oz Wichman explained that as in previous years, though the budget allows for $400,000-plus in expenditures, he does not foresee the water district actually spending that entire amount. He provided an expenditure projection of $233,500 for the coming fiscal year. The priciest items on the tentative budget revolve around man-hours. These are for Nye County staff assistance, the water district administrative assistant, engineering reports and grant applications, legal services and Wichman’s pay as general manager. Nye County staff assistance includes part of the salary paid to John Klenke, a geoscientist with expertise in water, Nye County Comptroller Savannah Rucker for her assistance with the district’s financials and other county staff as necessary. The water district’s fiscal year 2018-2019 tentative budget allows for $80,000 for this line item but Wichman said he believed only $65,000 of that would be spent. The water district’s administrative assistant is budgeted at $50,000 with $45,000 projected to be expended. Engineering reports are something the water district has been working on for some time. The board approved a contract with Shaw Engineering a year ago to sift through the cost versus benefit of a variety of recommendations contained in the Basin 162 Groundwater Management Plan, specific to the Pahrump Valley. Wichman has also incorporated grant applications into the engineering line item for the coming fiscal year, in the hope of securing funding that would make it possible for the water board to explore the deep carbonate aquifer. Engineering reports and grant applications have been budgeted at $50,000 with the tentative budget noting that the projected expenditure was $20,000. Legal services, provided through a contract with the law firm Kaempfer Crowell, has had $50,000 allocated to it, with Wichman projecting $20,000 would be spent. The total budgeted for Wichman’s pay is $90,000 but he said he believes he will only end up invoicing the district for $40,000 in fiscal year 2018-2019. Smaller line items include the breakdown of the operation of the district, baseline programs such as conservation school events and the volunteer domestic well metering program and interim projects such as water quality sampling. The water board will host its budget hearing on Monday, May 21 when the final budget is scheduled to be approved. After successfully endeavoring to have Nevada State Engineer Order #1293 issued, the Nye County Water District Governing Board is slowing its pace. The board has been meeting on a monthly basis since its formation a decade ago but now the meeting schedule has been changed. 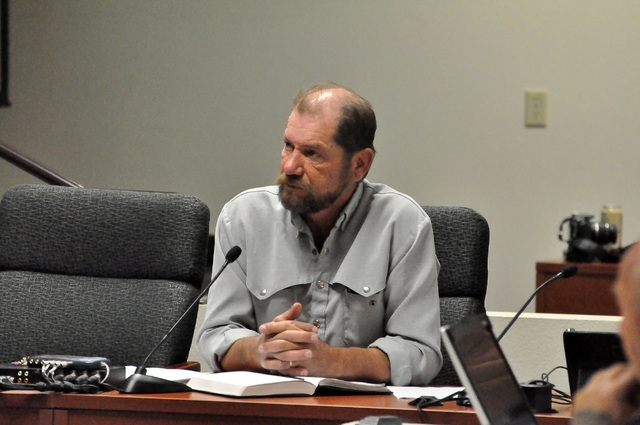 Rather than meeting approximately every four weeks, Nye County Water District General Manager Oz Wichman said he would prefer the water board only meet once every other month, unless circumstances require a meeting in between months. The water board did meet again in March but it will not meet in April. Its next meeting is set for Monday, May 21, when its budget hearing will take place. Following this, the board is scheduled to meet again on July 30, followed by September 24.